Emergency lighting and heating play a vital role during disasters such as frigid winters, hurricanes and tornadoes and earthquakes. However, not all emergency lighting and heating gadgets are created equal. Some of the important factors to consider when buying these gadgets include safety, power source and ease of use. With that in mind, here is a quick review of the best emergency heating and lighting solutions on the market today. Weighing less than a deck of cards and measuring 1 inch thick when flattened and about 4 inches high when inflated, this VERY amazing inflatable, small, compact and lightweight lantern comes with an in-built solar power for recharging. I will tell you right away. I’m biased. I love this. I love Survival Frog (which is where I got mine – they come in a pack of 3). In fact, if I am not mistaken, this is Survival Frog’s most popular product! Charges relatively quickly and requires no batteries. Can provide up to 12 hours of light and retain its charge for up to 3 years. • It does not offer the throw distance of a flashlight. I have to tell you though, the Luci is my absolute favorite. Mine is shown in the picture here! Just get this for yourself. It’s also great lighting when you’re sitting around outside on a nice summer evening. A typical headlamp consists of a small LED light that is worn on the head. By leaving your hands free, a headlamp would make it a little bit easier for you to find your way in the dark. I can’t actually tell you how many headlamps we have in our house! • It does not require you to hold it with your hands. • Most new models come with power-saving options. • Similar to a flashlight, it is not ideal lighting up a room or other general lighting tasks. According to customer reviews on Amazon, the best headlamps brands include the Coast HL7 Focusing, Black Diamond Storm, and Petzl Actik Core. The price of these headlamps ranges anywhere from $40 to $100. A flashlight is basically a relatively small, handheld light. However, not all flashlights are created equal. Specifically, some flashlights use an old-style light bulb while others use LED. Additionally, some use standard alkaline batteries while others use rechargeable batteries. • Available in a wide range of options. • The weight of the batteries can be significant. • Batteries can be expensive. Top flashlight brands on Amazon include ThruNite, Streamlight, and Pelican. On the price front, expect to pay anything from $7.00 to $20.00 for a flashlight depending on the brand and features. The lowly candle is, of course, the old “stand by” and original emergency lighting gear. We still use them in our house! 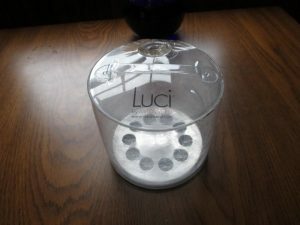 Even with our Luci inflatable solar lanterns, we do still have them. Personally, I like soy candles since they are a cleaner wax. They don’t last as long as other candles do though. For true “emergency” candles, you can try the liquid paraffin types like the “115 Hour Plus Emergency Candles, Clear Mist” on Amazon, which comes in a set of 3 for about $28. They are getting a solid 4.3 rating, with over 60% 5-star, and over 20% 4-star. If you prefer ordinary wax candles, there are the “UCO 9-Hour White Candles for UCO Candle Lanterns and Emergency Preparedness” also at Amazon. Get a 20-pack for about $27! As the name suggests, a kerosene heater produces heat by heating kerosene fuel. • Able to heat relatively large spaces quickly and efficiently. • Cost effective — You can buy kerosene from gas stations for about $4.00 per gallon. However, it is important to note that the 1K kerosene sold in stores goes for about $10 per gallon. • Kerosene fuel is not readily available in some areas. • Gives off a strong, unpleasant odor when lighting of shutting off. • May not have a mechanism for adjusting the heat output. Some of the best kerosene heaters brands available on Amazon, according to customer reviews, include Dyna-Glo KFA125DGD, Heat Mate Radiant, and Mr. Heater F270270 MH75KTR. A propane heater produces heat by burning compressed propane gas, which is in liquid form. The main features of a propane heater include an igniter, an element, and a pilot light. • Heats up relatively quickly. • Burns cleanly and does not give off an unpleasant smell. • Does not require frequent maintenance. • Propane gas is readily available in most areas. • Emits carbon monoxide gas. • A potential fire hazard. Wood stoves are a great way to heat your home, as well as cook and boil water in a power outage emergency. • Able to heat up relatively large spaces quickly. • Can be used for various tasks including cooking and boiling water. • Unlike gas and oil, wood is a sustainable source of energy. Another thing that many people don’t realize is that if you get a camper’s “Box Oven,” you can bake on top of your wood stove. I know, because I do this! You wouldn’t believe what you can cook on top of a wood stove (or even a propane stove) using a simple box oven. • Expensive to install and maintain. Some of the top wood stove brands on the market today include Drolet, Drolet, and Vogelzang. I personally have a Vermont Castings Encore. Today, that will run over $3,000 (maybe higher!). Soapstone stoves heat longer and evenly. They are also beautiful! To prepare for a disaster effectively, include some of the emergency lighting and heating options discussed in this article in your disaster preparedness plan.